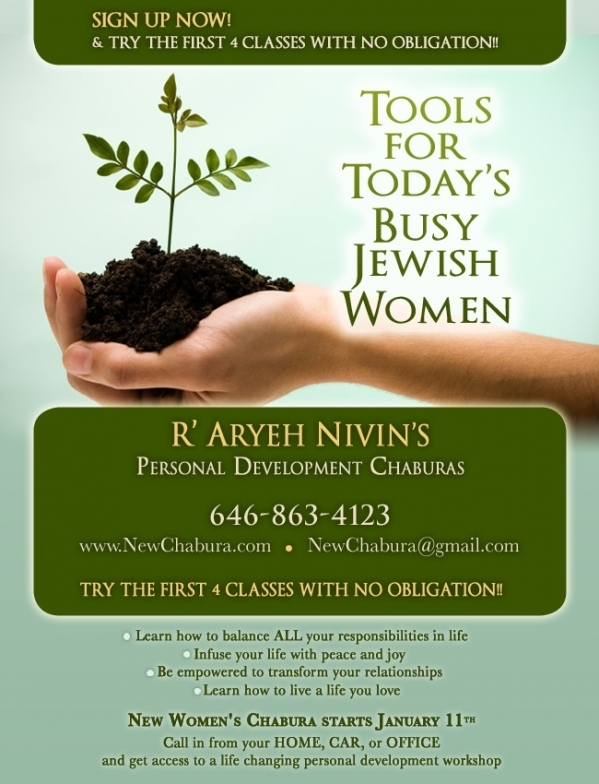 A year ago this month, two women who read this blog told me that I absolutely had to try out the Personal Development Chabura of Rabbi Aryeh Nivin. Looking back, I understand that that was quite possibly the best advice I have ever received. No class or course I have ever taken has improved my life as dramatically as this chabura, and I HIGHLY recommend it from the bottom of my heart to every Jewish mom reading this. If you’ve been on this mailing list for a while, you know that over the years I have never ever sent out a special mailing like this to promote anything. But I have decided to send out this special mailing in order to tell you moms about an unprecedented, once-in-a-lifetime opportunity being offered by Rabbi Nivin in honor the Chabura’s 5th Anniversary. Try the first 4 sessions for free, with no obligation! And, as a special incentive to JewishMOM.com readers, every woman who registers for this 4-week offer will automatically participate in a raffle to win an entire free 3-month-session of the Chabura (worth $150). TO be included in the raffle, make sure to mention JewishMOM.com when you register. Do me a favor, do yourself a favor, don’t miss this incredible chance to start living the life of your dreams.